DigiServ Technologies cc - Knowledgebase - How do I configure my POP mail account with Outlook 2003? 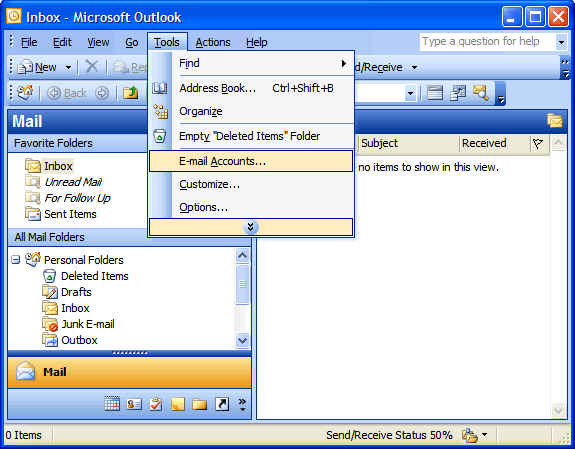 Portal Home > Knowledgebase > E-Mail Tutorials > How do I configure my POP mail account with Outlook 2003? 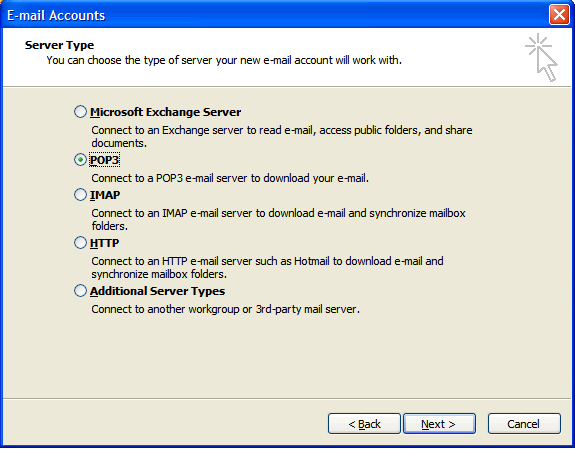 How do I configure my POP mail account with Outlook 2003? First, you need to add the mail account to your control panel. 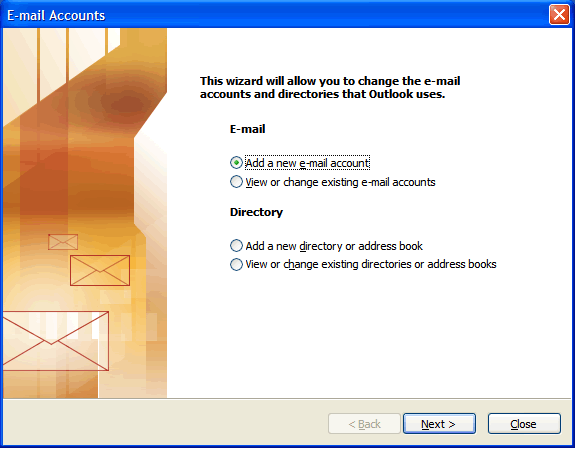 Once you have added the mail account, you can continue setting up your Outlook for mail access. Enter your first and last name. This name will display to readers of your e-mail messages. Enter your e-mail address. (this must be configured in the your control panel first). Enter the password for your e-mail account (the one you used when you created the mail account in your control panel), and then select the check box "Remember password". Your incoming server is mail.yourdomain.com, where "yourdomain.com" is the name of your domain. 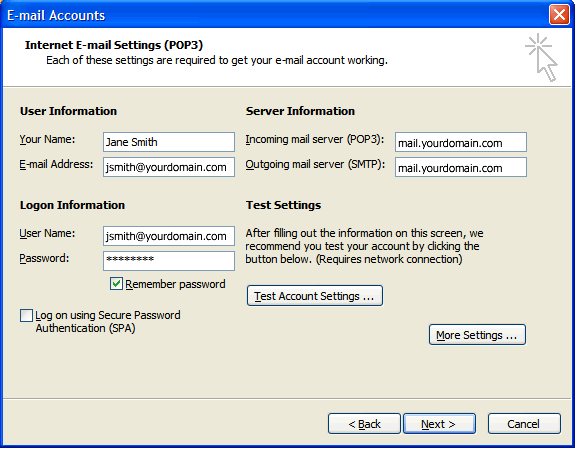 Enter mail.yourdomain.com for your outgoing mail server, where "yourdomain.com" is the name of your domain. NOTE: If your ISP blocks the default port 25 to our network you will need to change the port to 26 which is our secondary SMTP port setup for such cases. 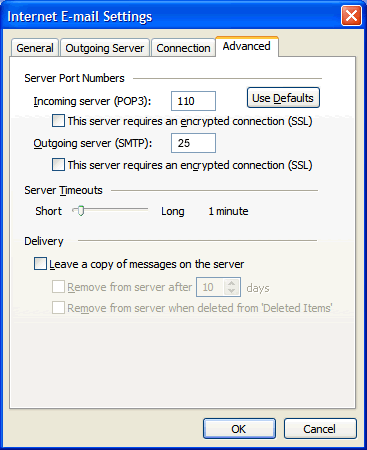 On the Internet E-mail Settings window, select the "Outgoing Server" tab. 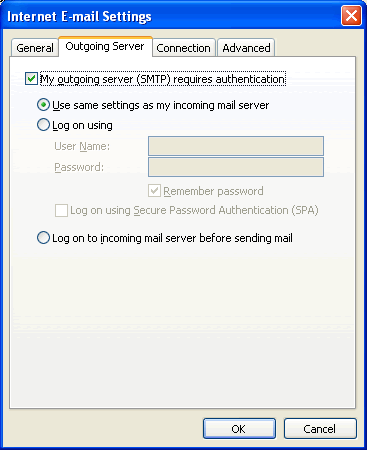 Select "My outgoing server (SMTP) requires authentication." Select "Use same settings as my incoming mail server".